TLP Portfolio is a fully responsive plugin that display your company or personal portfolio/ Gallery items. From admin panel you can easily add your portfolio items. It has widget included with carousel slider with different settings how many want to display total or at a time and many more. It has the different custom fields Short Description, Project URL, Tags, Tools/ Technique used. Portfolio Gallery is perfect for using for creating various within various views. Product allows adding images, videos from youtube and vimeo, descriptions and titles for each. Portfolio Gallery is rather useful whether using with various pages and posts, as well as within custom location. Plugin provides you Free version to test all 7 gallery views, slider gallery options and other basic functionalities. 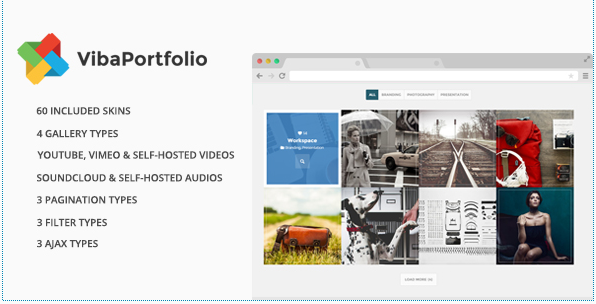 Portfolio is an amazing and powerful WordPress portfolio grid plugin designed to help you display your portfolios, works, clients or even team members in an elegant style. 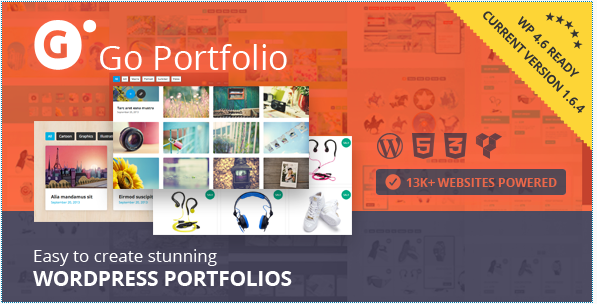 Portfolio provides the all necessary features you’ll need to showcase your portfolio items, clients and team members. This plugin adds a “Portfolio Item” custom post type with associated “Portfolio” and “Porfolio Tag” taxonomies. This plugin registers a custom post type for portfolio items. It also registers separate portfolio taxonomies for tags and categories. If featured images are selected, they will be displayed in the column view. This plugin doesn’t change how portfolio items are displayed in your theme. You’ll need to add templates for archive-portfolio.php and single-portfolio.php if you want to customize the display of portfolio items. This is beautiful responsive portfolio with responsive lightbox plugin for WordPress blogs and sites.Admin can manages any number of videos,images,links into the portfolio grid. Admin can add,edit and delete videos,images,links from portfolio.admin can set media title to lightbox.Before add portfolio to wordPress blog admin can preview a portfolio grid. Admin can set height,width of portfolio media.Admin can also set backgroud color of portfolio. Responsive Portfolio is based on bootstrap framework. You can Add unlimited images on your blog site. This plugin is mobile compatible and support on any device.Responsive Portfolio is provide gallery with masonry effect and lightbox preview. Using [WRP] shortcode, you can publish image or photo gallery into any Page or Post in your WordPress sites. 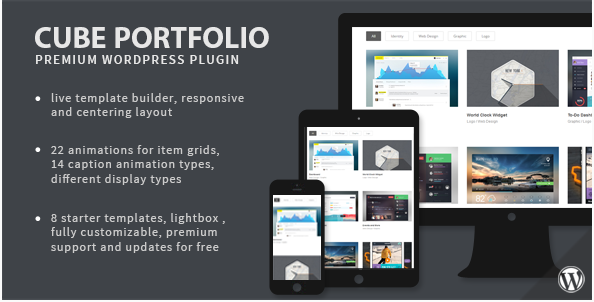 This plugin is the ideal solution for creating portfolios, showcases or teasers. You can create new custom post types or use your existing blog posts, custom post type posts or products. If you would like to create a portfolio or looking for a complete solution managing portfolios, this product is a useful tool for you. It’s very easy and fast to create stunning portfolios and integrate them into your WordPress site using. You will surely find the one most appropriate for you, which can be customized in a few seconds. Ultra Portfolio is a WordPress plugin used to build portfolios in any desired layout with ease. Grid, Masonary, Carousel Slider, Single slide, Classic blog style, Full width, Spaced, Outer content, Above media content, Left and right side content etc. styles of portfolios can be built. WooCommerce seamless integration takes the plugin one step further. Ultra Portfolio is designed using AJAX based User Interface. It makes the plugin amazing fast, easy and fun to use. 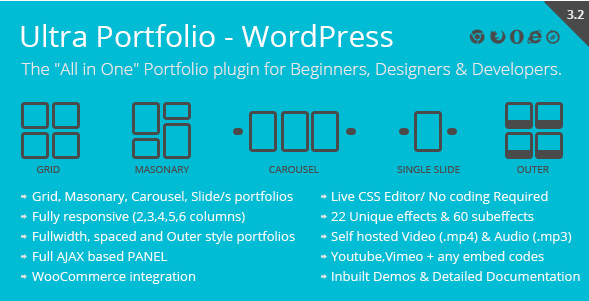 Plugin helps you to create portfolio in few minutes. Modifications can be made with few simple clicks in seconds. Live CSS editor panel makes life even easier. Not only it saves time exponentially, but Ultra Portfolio also helps you to create unique and creative portfolios using interactive Effects & their Sub effects. Also to create a portfolio No coding knowledge is required. No matter if you are a beginner, Intermediate, Designer or a Developer, Ultra Portofolio is designed to suit everyone.